ESPN saw a big drop from last year's record-setting College Football Playoff title game. When it comes to the viewership of Monday night's college football's championship game, it's both good news and bad news for ESPN. The good news: The Alabama Crimson Tide's thrilling 45-40 win over the Clemson Tigers was the most watched telecast on cable since last year's inaugural College Football Playoff title game bringing in an average audience of 25.6 million viewers. The bad news: That number was considerably down from last year's game, which had the largest audience in cable TV history with 33 million viewers. The numbers come after the Worldwide Leader in Sports saw viewership for its telecasts of the National Semifinal games on New Year's Eve fall drastically for both the Cotton Bowl and the Orange Bowl. Some sports media observers blamed the drop on the fact that the games were played on New Year's Eve, one of the biggest nights of the year for going out. Last year's National Semifinal games were played on New Year's Day. Others pointed to the games themselves, which were both lopsided blowouts, and even the popularity of "Star Wars" for the viewership decline. 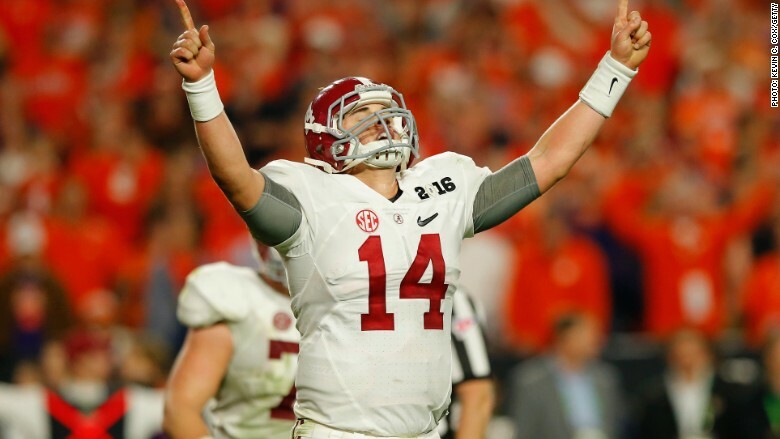 Digitally, the Alabama and Clemson title game was a success for ESPN. The National Championship ranked as the one of the biggest sporting events in the history of the WatchESPN app, only behind a handful of 2014 FIFA World Cup games, bringing in 1.9 million unique viewers, according to the network.